← Is It Time To Revamp Our Laws Governing Paedophiles? KUALA LUMPUR (AFP) – Influential former Malaysian leader Mahathir Mohamad on Thursday launched a stinging attack on beleaguered Prime Minister Najib Razak, demanding explanations in two highly sensitive scandals and warning the ruling party will lose power with Mr Najib at the helm. He also said Malaysians “no longer trust” Mr Najib. Dr Mahathir’s broadside is significant because the retired 89-year-old former strongman spearheaded a campaign against his own successor, Tun Abdullah Ahmad Badawi, which resulted in Mr Abdullah’s 2009 ouster and replacement by Mr Najib. In his widely read blog, Dr Mahathir waded into previously taboo territory in calling for the truth to be revealed in a sensational scandal linked to Mr Najib that concerned alleged corruption in a submarine purchase and the still-unexplained 2006 murder of a Mongolian woman. He also raised questions over a state-owned investment company launched by Mr Najib that is mired in US$11 billion of debt and has been hit by numerous reports of alleged fraud and questions over the whereabouts of hundreds of millions of dollars. Dr Mahathir, whose 1981-2003 rule was marked by crony capitalism and a sharp curbing of civil liberties, has ramped up pressure on Mr Najib since the Premier led the long-ruling Umno to its worst showing ever in 2013 polls. 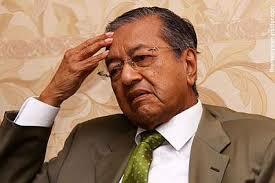 But Thursday’s comments were Dr Mahathir’s harshest yet. “Umno members and their leaders must realise that (the ruling regime) will lose if (Najib) leads Umno,” into the next elections due by 2018, he said. 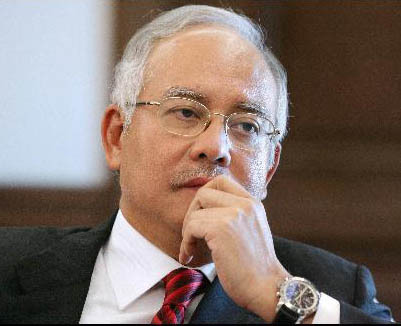 The 2002 purchase of French submarines – negotiated when Mr Najib was defence minister – has long been clouded by accusations of kickbacks to Malaysian officials. The government denies wrongdoing. Ms Altantuya Shaariibuu, a Mongolian woman who purportedly acted as a translator in the negotiations, was killed in Malaysia in 2006 and her body blown up by military-grade explosives. Suspicions have swirled for years that Ms Altantuya was murdered to keep her quiet about the kickbacks. Two bodyguards for Mr Najib were convicted of murder and condemned in January to hang. One is in Australian custody, where he fled late last year. A motive for the killing was never established. “People are asking who gave the orders,” Dr Mahathir wrote. There are fears that the troubled Najib-launched investment fund, 1Malaysia Development Berhad (1MDB) could collapse and hit the economy, concerns that have added to recent downward pressure on the ringgit currency. Dr Mahathir called 1MDB “highly embarrassing” for the country, and demanded explanations over alleged murky deals involving huge sums, and over reports of huge wealth enjoyed by Mr Najib’s family. Mr Najib has ordered the auditor-general to look into 1MDB but has denied any wrongdoing. Analysts have said Dr Mahathir’s campaign so far looks unlikely to topple Mr Najib, who remains strong in the party. “Hello pot, meet kettle,” said Wira Salim, 45, a Bas Sekolah driver.